The Internship and Workforce Services will be hosting a Lunch and Learn on September 18, 2018 from 12pm-1pm in Room 8-101. 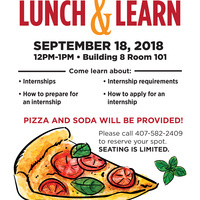 The Internship Lunch & Learn will allow Valencia students to gain insight on how to prepare for an internship, internship program requirements, how to apply for an Internship, and qualities employers look for in candidates. For those students that are interested in attending this event, please call the East Campus Internship Office at 407-582-2409 to RSVP. Please call the East Campus Internship Office at 407-582-2409 to RSVP.